She offers a formula: A person’s happiness = their happiness set point, + life circumstances, + how they spend their time in volitional activities (H=S+C+V). Set Point is the degree to which one’s individual biology determines the amount of various chemicals in the body. This produces a great mix of neuro-transmitters that lead to a healthier outlook on life. This makes up 50% of the happiness pie. 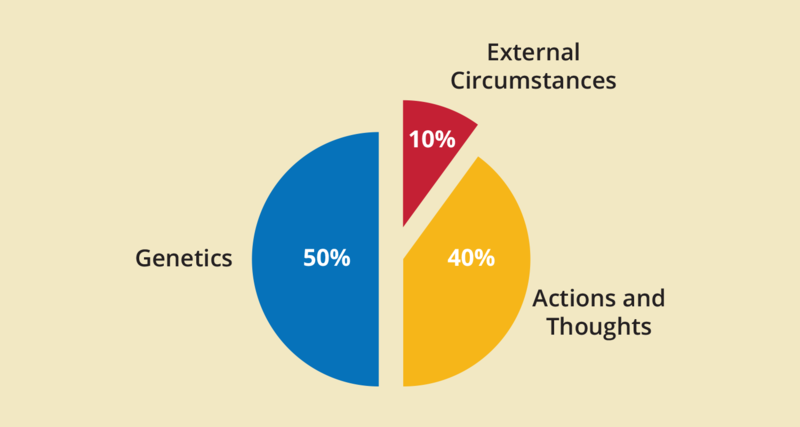 10% of the pie is determined by one’s life circumstances. These are things that we might call conditions of birth—gender, race, geography and socio-economic status we were born into. Volitional activities make up 40%. This slice is about the things over which we do have control—career, relationships, and hobbies. We can’t do much about the first two (set point and conditions), but, by definition, we have a great deal of control over the choices of activities in which we engage. This is where the link between themes and happiness resides. Example: Someone has the best possible brain chemistry (50 out of 50) and great life conditions (10 out of 10). This person lacks self awareness and self management and, therefore, has made poor choices in career, life partner, etc (0 out of 40). That person’s happiness is 60 out of 100. Example 2: Someone with average brain chemistry (25 out of 50) and average life circumstances (5 out of 10) also has found their ideal fit between who they are and her environment (40 out of 40), for a happiness score of 70 out of 100. This concept, individual-environment fit (IEF), is central to our Talent2Strength framework. 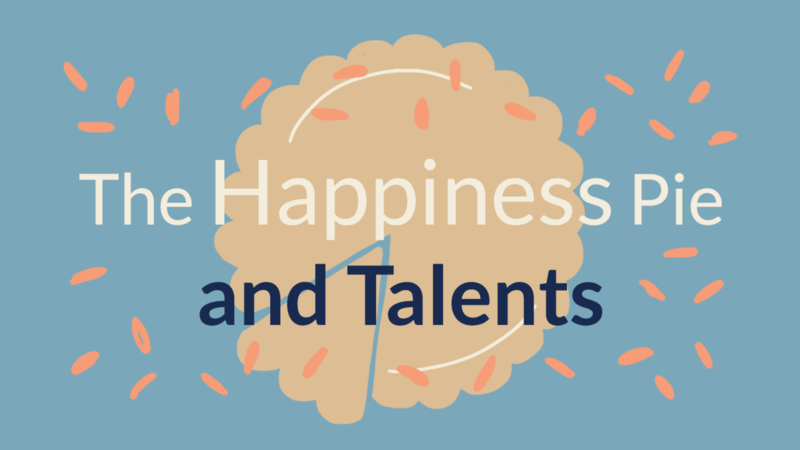 By focusing on a person’s unique qualities and then shaping that person’s environment to be a solid fit, we can greatly increase the overall happiness pie for ourselves and others. This information is incredibly insightful and empowering. It separates the things over which we have much control from those over which we have little. The CliftonStrengths assessment, formerly known as the StrengthsFinder, helps identify that natural quality that we call “themes of talent” (not strengths, read more about that here: “Themes vs. Strengths”). Themes are naturally recurring patterns within a person for how they think, feel and behave. If happiness is a feeling, then themes matter quite a bit for what makes a person happy. When we understand the language of the 34 themes, we can identify the sources of happiness and other sources of positive emotions in our lives. We can also identify the causes of negative emotions. We cannot do anything about the negative emotions themselves, but these emotions produce awareness, so we can take action to shift them more toward sources of positive emotion (or Alignment). The presence of the various themes indicates why our volitional activities contrast or align to them. If you had a job that required careful review data to make decisions, this can be a great source of alignment for people with themes like Analytical, Focus, Deliberative and Discipline. Conversely, it might be a source of contrast for those with themes like Adaptability, Empathy or Woo. For the latter group, a career that requires them to work without much human interaction in a methodical way can become an engine that produces negative emotion. Each activity represents some degree of match or mismatch with our dominant themes. Yet, we have volition (or choice) over many of the activities that make up our day-to-day. Without knowing one’s themes, it is difficult to identify those sources of match (alignment) and mismatch (contrast). But, with a clear understanding of our dominant themes, we can have much greater clarity of our volitional activities and make better choices. A skilled strength interventionist has the ability to assist clients in reducing contrast and increase alignment, leading to increased overall happiness.